Along the way St. Paul composed many epistles to the churches he founded, as well as letters to individual people he met and with whom he worked. The epistles address specific problems and issues in the newly-formed communities, such as factions and division in the Corinthian community; they correct errors in teaching, such as those in the Galatian communities; and they encourage and praise the believers, such as those in the Thessalonian, Philippian and Ephesian communities. St. Paul's personal letters to his young mentor, Timothy, praise and encourage him, as well as offer him very practical advice on specific problems he faces in his ministry; Paul's letter to Titus encourages him to "finish up the work" Paul had sent him to do in Crete, for apparently Titus had been dithering there; and St. Paul crafts a brilliant one-page letter to Philemon, a not-so-subtle exercise in rhetorical arm twisting, encouraging Philemon to accept Philemon's runaway slave, Onesimus, no longer as a slave, but as a brother in Christ. Although written late in AD 57, St. Paul's epistle to Rome is an astounding display of formal argumentation, supporting St. Paul's thesis that we are "saved by grace through faith in Christ." Crafted as a formal scholastic diatribe, Romans stands among the greatest statements of Christian faith ever written. It is St. Paul's "declaration of independence" from the Law and his Credo, a foundational argument that has shaped Christianity for the past 2,000 years. 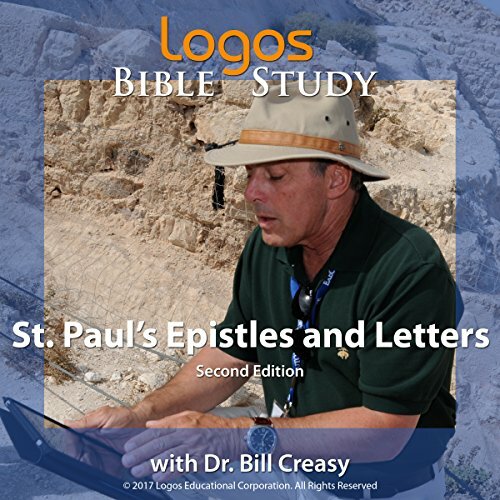 This series on St. Paul's Epistles and Letters, taught masterfully by Dr. Bill Creasy, shines a bright light on some of the most significant documents ever written, and Dr. Creasy presents them as only he can - with intellectual integrity and profound theological insight, coupled with humor, wit and his characteristic, boundless enthusiasm. Just listened to the lecture on Romans and found it absolutely brilliant, would definitely recommend .